Ritani’s fresh, millennial style is evident throughout their designs, with a look that would be best described as contemporary and minimalist. They incorporate their Instagram account into their homepage and feature their signature #GetTheMomentRight at the bottom of the page. Their use of shareable images demonstrates their emphasis on social media as an advertising tool, and thus the rest of their website is fairly void of ‘obvious’ marketing techniques. Ritani’s well crafted ‘top-down’ design and editorial photography present a seemingly coherent, contemporary and luxury brand. I am going to explore whether or not the quality and value match up to their sleek branding. Did you know that Whiteflash is an authorized seller of Ritani Settings? They are also the home of the exclusive A CUT ABOVE® diamonds which are in my opinion the best quality cut diamonds available online. Ritani was founded in 1999 by Harout Aghjayan (the brother of another jewerlry designer, Vatche Aghjayan) and Brian Watkins, the former executive at Blue Nile. 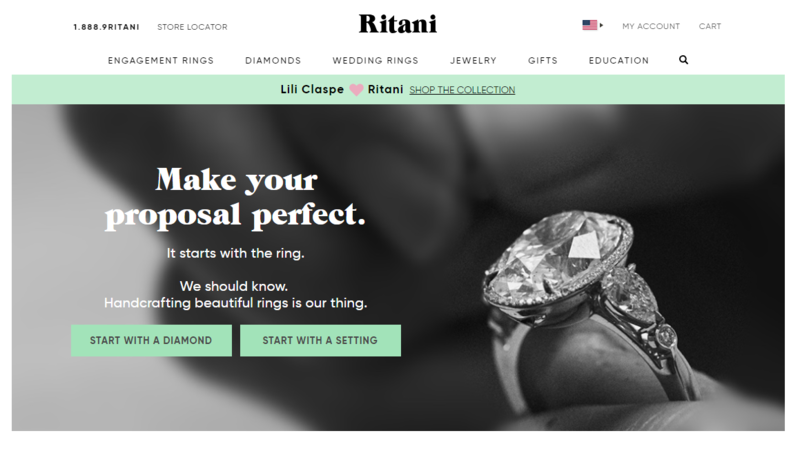 Watkins helped Ritani became the strong contender of omni-channel jeweler we see today. In mid-2016, Watkins stepped down as the president for personal reasons. In January 2017, Deborah Fine became the new CEO of Ritani. Fine has a highly accomplished and diverse career before Ritani where one of her achievements being the CEO of Victoria’s Secret Pink. She has two decades of experience in leading businesses to record growth and profit. Ritani sought to merge the luxury retail experience with the unstoppable force of online trade. Known as their ‘clicks and bricks’ approach, Ritani offer a security net to those who are less comfortable with a straight online purchase, by allowing them to have their selection sent to one of their authorized bricks and mortar jewelers. Ritani offer a huge selection of engagement ring settings with 470+ listed on their website. This huge selection does not mean that quality is compromised, in fact, it is quite the opposite. Each Ritani setting is crafted by masterful bench jewelers at their HQ in New York. Perhaps the most notable feature of Ritani settings is their use of pave and micropave techniques. 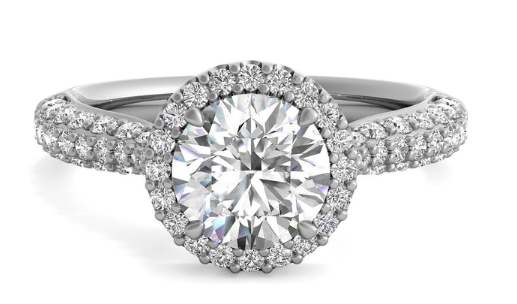 As seen here in this pave halo engagement ring, there is real attention paid to the finer details and finish of the setting. A badly done pave setting can have a grainy look and actually reduce sparkle, however I find Ritani’s to be some of the best that I have seen on the mainstream market. Ritani also offer their ‘Masterworks’ collection. This is a tactic used by top jewelry houses such as Cartier and Van Cleef and Arpels to distinguish their most intricate, expensive, and unique designs from their standard collections. The pieces are selected by their master designers. While Ritani may not be out to compete with those powerhouses, but by offering a masterworks collection continues to suggest a luxury and stand out brand. They offer settings in 18k rose, yellow and white gold as well as 14k white gold and platinum. The addition of 14k white gold is perfect for those who have fallen for a unique Ritani setting and are working within a budget. On the whole, it is difficult to not be impressed with both the quality and variety of Ritani settings. The final decision ultimately rests on price, which we will look at shortly. I commend Ritani for only listing GIA and AGS diamonds on their website. Should you choose to select a diamond directly from Ritani themselves, you will at least be secure in the knowledge that it comes with an internationally respected certification. I also found that, while their diamond inventory is undoubtedly smaller than their competitors, they do offer a good selection of fancy cuts. 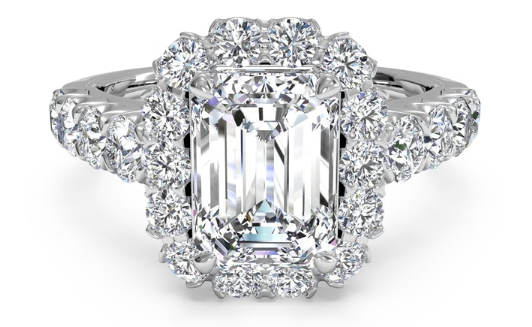 It is common for retailers with a smaller inventory to favor round brilliant and princess cut diamonds, and while this is of course the case, Ritani do not neglect the more unusual cuts in their offerings. They offer an HD video for their diamonds, very similar to that used by Blue Nile, James Allen, and Whiteflash, which is a great tool for getting a better sense of the diamond beyond the certification however the quality of cut of the diamonds is well below that of many of the other online diamond suppliers. I would recommend sourcing diamonds from a specialist like Whiteflash, their Super Ideal A CUT ABOVE® diamonds are the best cut quality available online. Whiteflash are also an authorized seller of Ritani Rings so you can purchase both the stunning Ritani Setting and ideal cut diamond from there. For the purpose of this article I will be looking at the price of Ritani settings alone (i.e. without the center stone). The price of your final engagement ring is entirely dependent on the cut, color, and clarity of the diamond you choose, therefore to accurately assess the price of Ritani, it is easier to look at the settings in isolation. Beginning with the cheapest offering on Ritani’s official website, a 6 prong, 14k white gold solitaire setting will set you back $245. The same setting costs $180 on Blue Nile’s own in-house setting, so a difference of $65. On James Allen, a six prong 14k white gold solitaire setting will cost you $240. One of the perks of the Ritani website is it states the weight of the setting, a feature not offered by the many competitors. A heavier ring will cost more and is generally more desirable. The fact they give the weight of mtal also means you can accurately compare how much you’re getting for your money (for those who are making every penny count). On the whole, Ritani come in fractionally pricier than its competitors, with both settings and diamonds coming in at usually around 5% more expensive. I would argue that this can be justified by the level of craftsmanship that goes into the rings, particularly those featuring a pave setting. It must also be said that some of Ritani’s unique designs will be difficult to find on Blue Nile or James Allen, therefore simply cannot be compared. 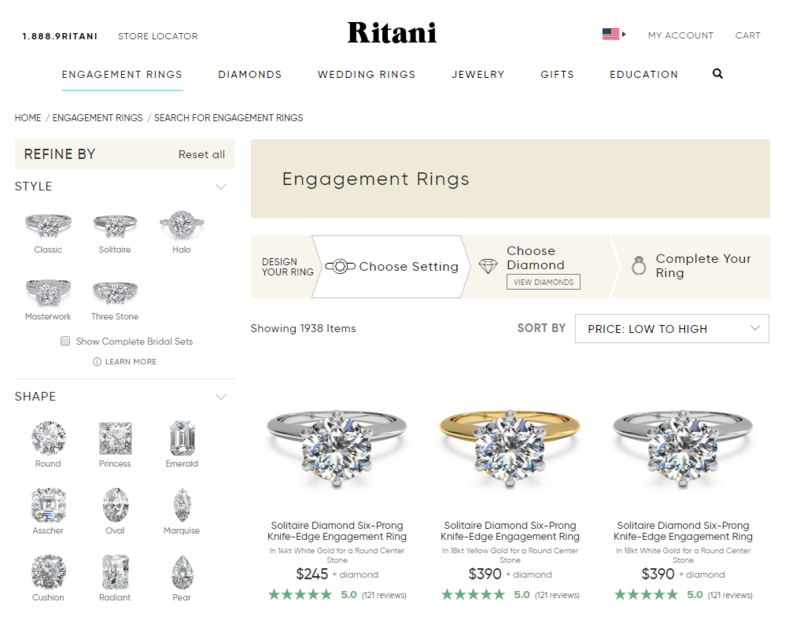 In terms of the diamonds, Ritani is yet to reach the level of inventory offered by their competitors, and the fact that not all of the listed diamonds have high-quality videos can make your search tricky. 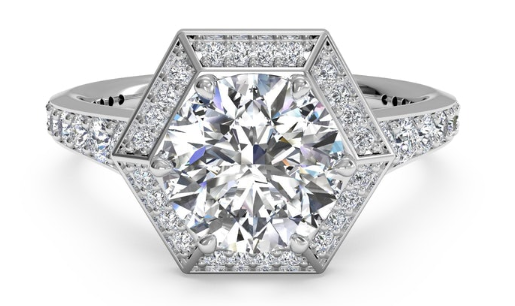 On the whole, while I believe their settings are fairly priced, I would recommend pairing them with a higher quality diamond from Whiteflash where you will find more selection and ultimately have a better ring overall. The service that sets Ritani apart is the ‘clicks and bricks’ feature mentioned earlier. This offers nervous buyers the chance to have their chosen ring sent to one of Ritani’s many authorized jewelers in the states. The only real benefit of Ritani’s clicks and bricks option is you will get to have an ‘in-store’ experience, which for some people is an important part of the buying process. For the majority of buyers, this feature is a waste of time. That said far betting quality diamonds are available elsewhere which I mentioned in this article, with the A CUT ABOVE Diamonds from Whiteflash being the best, I would also recommend looking at the Blue Nile Astor Collection as well. In addition Whiteflash provide very detailed light performance imaging of all their diamonds which many suppliers fail to do - this because they focus on the quality of the cut and are happy to provide this additional data. All online suppliers usually offer free returns up to around 30 days so there is no need to visit a brick and mortar store anymore. Ritani offer some exceptional and stand out settings, all of which prove their worth when it comes to detailing and craftsmanship. If you are looking for a simple solitaire design, you will save money elsewhere. However, if you fall in love with one of their unique designs, you would be hard pushed to find something of the same quality for a better price. I would absolutely recommend Ritani for anyone looking for an expertly crafted engagement ring that stands out from the crowd - remember to take a look at Whiteflash as they are an approved seller of Ritani Settings and for diamonds take a look at the A CUT ABOVE Diamonds from Whiteflash and it's worth also looking at the Blue Nile Astor Collection but usually their cut standard is not quite as high.